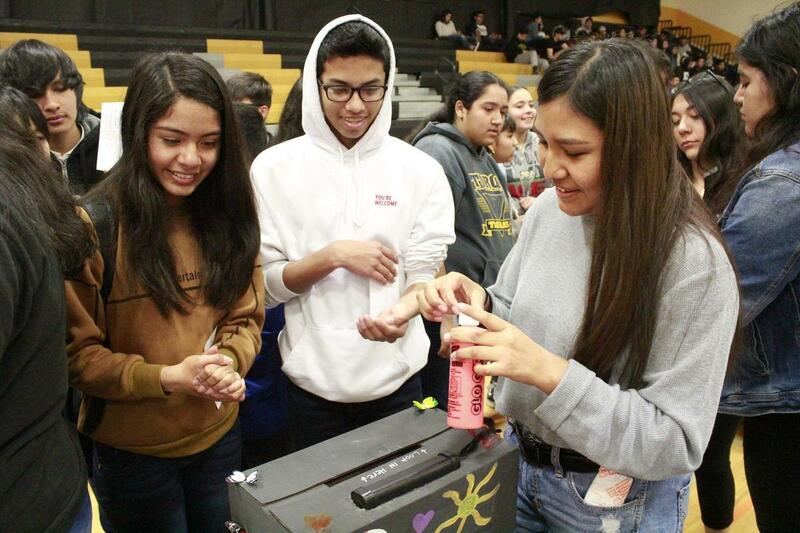 LA PUENTE – Bassett High School senior and President of the HOSA Club Maria Gonzalez worked with her group of four students to create a Public Service Announcement on the topic of a Tobacco Free Generation to present at the 2019 California HOSA State Leadership Conference, which starts Thursday, March 28 at the Sacramento Convention Center. Gonzalez wants to pursue a career as a registered nurse, and has applied to Cal State Long Beach, Cal State Fullerton, Cal Poly Pomona and has been accepted to Cal State San Bernardino. 03-27-19_BASSETT_HOSA_3: Bassett High School senior Maria Gonzalez uses a black light to show Torch Middle School students the germs on their hands as she highlights health care careers Bassett High School’s Pathways Showcase, held Jan. 30 at Bassett High School.